Do you know what it feels like to skydive? If you are here, you may have already experienced the thrill of skydiving and freefall in a tandem jump. Now, would you like to take the experience a bit further? 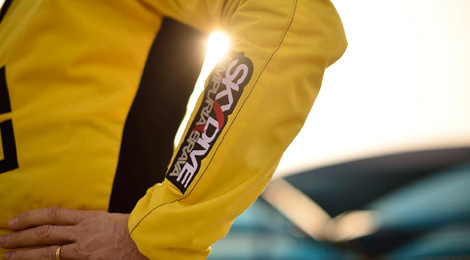 Our beginners’ skydiving courses are ideal for you. Even if you have never jumped but would like to learn how to jump solo. I want to be a skydiver! The AFF course or the AFF PLUS course is ideal for you! ...then the IFF (Mini AFF) is the course for you! Our AFF course will provide you with all the basic knowledge necessary to skydive by yourself in total safety. 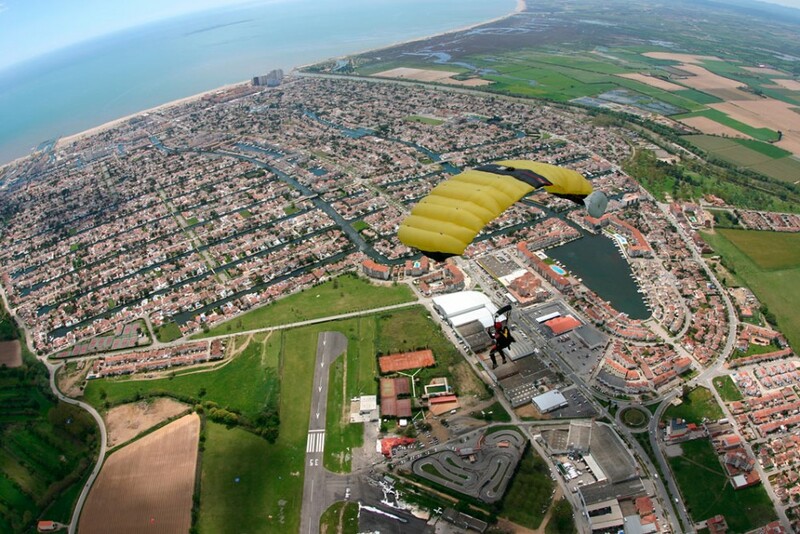 You will learn control while in freefall, and how to open your parachute and handle it until landing. The course lasts an estimated 5-7 days, depending on weather conditions. It can also be taken on several weekends. The AFF course is internationally recognised. 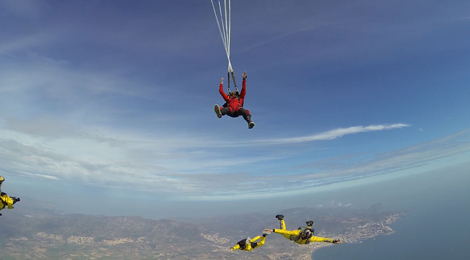 When you graduate you will therefore be able to jump not only at Skydive Empuriabrava, but also anywhere else in the world. Training is completely personalised. First you are given classes in theory and do practical exercises on the ground. You then fly up to an altitude of 4,000 metres for the first tandem jump. You may then take the 7 levels of AFF. 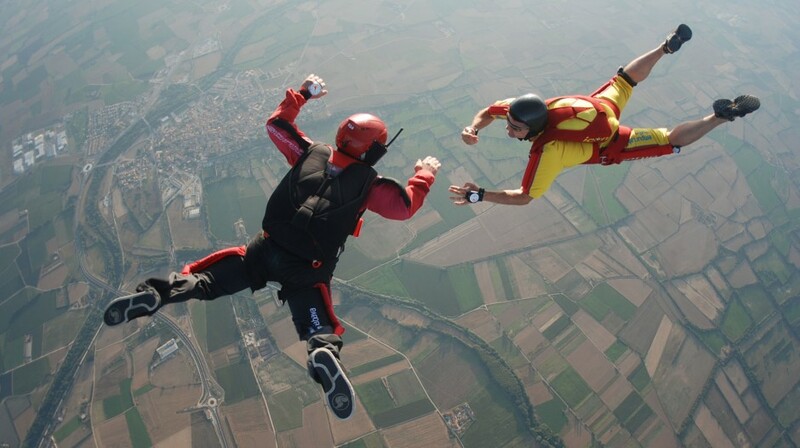 On your first tandem jump, you will practice exercises in freefall and under the parachute. You then will jump with two instructors, who will assist you in freefall: they will keep hold of your arms and legs, secure you and correct your position while you gain a further minute of freefall experience. Once your parachute is open, you should then steer it in to land. Your instructors will already have landed and will contact you by radio. During the first 3 AFF levels you will continue to jump with your two instructors, who will secure your arms and legs to correct your position, if necessary. As you gain in confidence and freefall experience, you will observe that they progressively let go of you. From level 4 to 7, your confidence will have grown slightly and you will jump with only one instructor. He will guide your progress as you learn how to do turns, loops and tracks, until you graduate after AFF level 7. Throughout the 7 AFF levels, we will record the exercises you do in freefall on video. While viewing the DVD, your instructors can analyse and review your jump extremely thoroughly, thus sharpening your learning curve significantly. 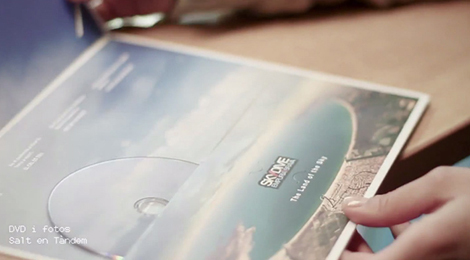 Your DVD will also provide a fantastic reminder of this great experience. The AFF PLUS course is internationally recognised. When you graduate you will therefore be able to jump not only at Skydive Empuriabrava, but also anywhere else in the world. In the AFF PLUS course training is completely personalised. First you are given classes in theory and do practical exercises on the ground. Next, you will fly up to an altitude of 4,000 metres for the first tandem jump in order to practice the free fall exercises and the canopy flying. 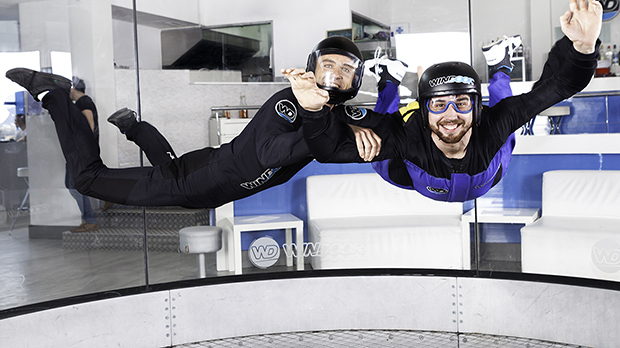 The next step will be done in the WIND TUNNEL (free fall simulator), where you will train specifically the free fall exercises that you will perform in the real jumps. Then you will jump with two instructors, who will assist you in freefall: they will keep hold of your arms and legs, secure you and correct your position while you gain a further minute of freefall experience. Once your parachute is open, you should then steer it in to land. Your instructors will already have landed and will contact you by radio. As you gain confidence and experience in free fall you will see how you will gradually be released. From level 2 you will jump with only one instructor. He will guide your progress as you learn how to do turns,loops and tracks, until you graduate. 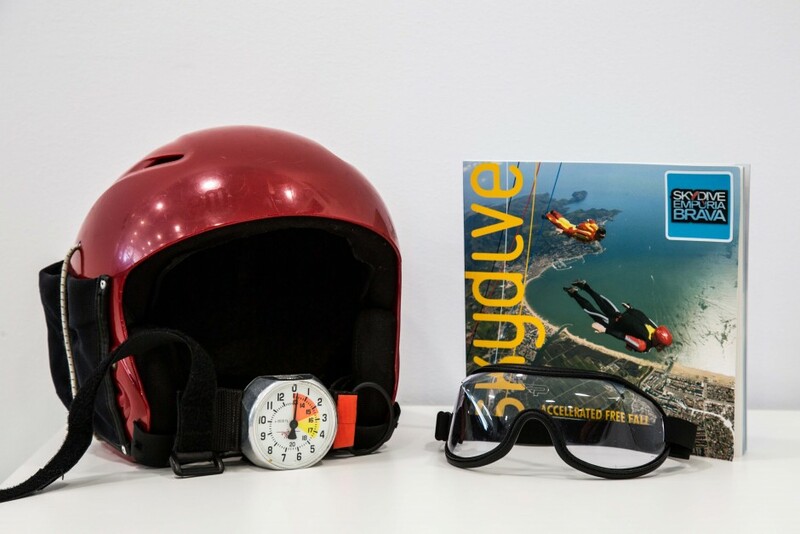 Throughout the levels of the course, we will record the exercises you do in freefall on video ( from level 2 to level 6). While viewing the video, your instructors can analyse and review your jump extremely thoroughly, thus sharpening your learning curve significantly. Your video will also provide a fantastic reminder of this great experience. 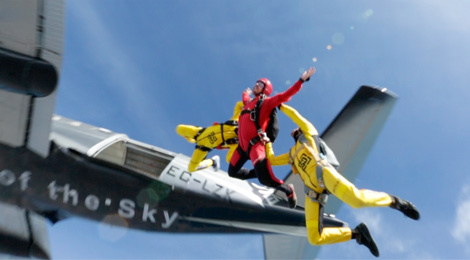 The IFF (Mini AFF) is a two-day introductory course to skydiving and to freefall. Upon completing it, if you opt to continue and obtain your license to jump alone, you can progress by taking a level 2 AFF course, as you have already received full theoretical training. Training is completely personalised. First you are given classes in theory and do practical exercises on the ground. You then fly up to an altitude of 4,000 metres for the first tandem jump. Lastly, you take AFF level 1. During your tandem jump you will practice AFF Level 1 exercises in freefall and flying under the parachute, under the constant supervision of your instructors. 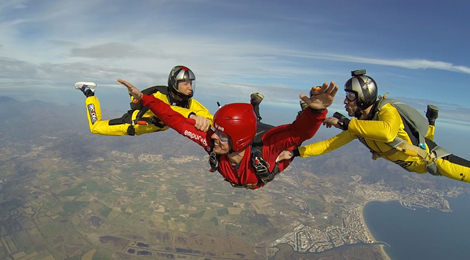 You will jump with two instructors, who will assist you in freefall. They will keep hold of your arms and legs, secure you and correct your position, if necessary, while you gain a further minute of freefall experience. Once your parachute is open, you should then steer it in to land. Your instructors will already have landed and will contact you by radio. We also record the exercises you perform during your AFF level 1 freefall on video. While viewing the DVD, your instructors can analyse and review your jump extremely thoroughly. The DVD will also give you a fantastic reminder of this great experience. You must present a medical certificate specifying that you are fit to do sport. Minimum age for skydiving is 16 years old. Under-18s must present notarised parental consent. Courses start at 9.00 am throughout the year. SPECIAL DISCOUNT (4% to 6%) for the courses done in between October and May. Once you have completed the AFF course, your instructor will explain the steps to follow and you can now jump solo! It is also the time to start thinking about what discipline you wish to take up. Each jump will henceforth help you gain in experience. We nonetheless recommend obtaining the A License and the FS1 (British Parachute Association) or the A License (United States Parachute Association) which will allow you to jump with other skydivers.